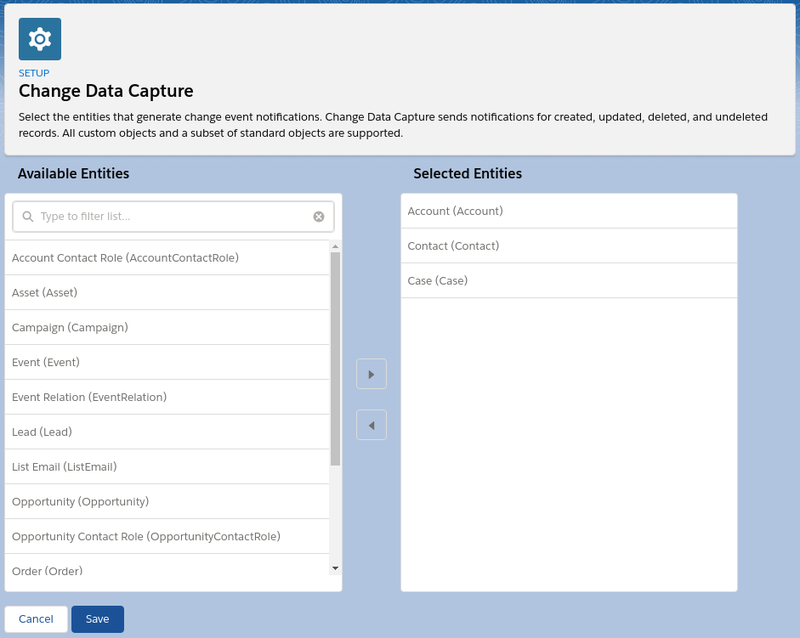 How do I setup Change Data Capture? This part is really quite simple. Go to the Setup menu and search for Change Data Capture then move your objects over from the left to the right side and click Save. I would recommend that you only do this with the objects you really want the data from. You can choose lots of objects but that’s going to generate lots of data. Now that we’ve got this set up, lets talk about how we actually use it. Change Data Capture uses the same endpoints as any of the other streaming API requests /cometd/[apiversion] and then you just tell it what channel to use. The channels vary depending on if you’re trying to get all objects /data/ChangeEvents, standard objects /data/<objectName>ChangeEvent or custom objects /data/<ObjectName>__ChangeEvent. The fully complete code that we’ll be working from can be found on my github. I’ll be covering the key parts of the code that make it all work but it won’t be enough code to make it run 100%. So if you want to run it, checkout the repo. After we’re logged in, we can get our instance URL as well as our access token. These will then be passed into the cometd configure method. As I said before the stuff above isn’t whole code. So download the code (and the package.json) from the repo and install the dependencies. You’ll also want to globally install bunyan to help format the logging output. Then you can run the code a couple of different ways however, all of them will require username and password and sometimes token if you’re org requires it. Now, to be honest, this code isn’t useful but it is a decent framework for how to get connected. You just need to add code to the cometd_processdata function to have it do work. The code could also stand to be refactored more so that the params aren’t passed around how they are but made into a global store. But this is just an example and not ready for production. This entry was posted in Development, NodeJS, Salesforce and tagged nodejs, Salesforce. Bookmark the permalink.